TV marathon helps bring relief to the Far East. 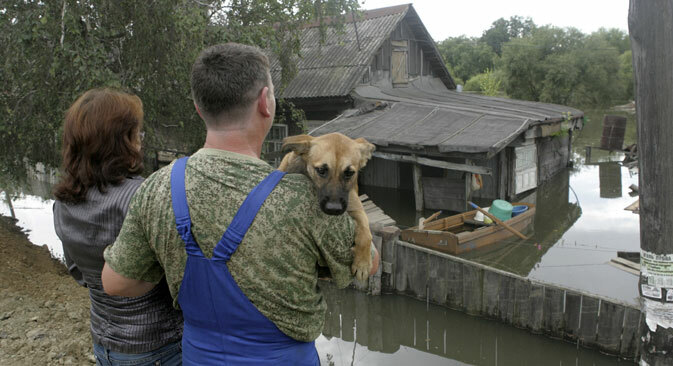 On Sunday, Sept. 29, Channel One broadcast a 10-hour TV marathon in support of flood victims in the Russian Far East. Provisional data shows that TV viewers donated more than 517 million rubles ($15.9 million) while the program was on the air. The money will be used to build new homes in the disaster-stricken region. Most of Channel One’s staff was involved in the event, and the TV marathon was supported by musicians such as Vladimir Spivakov, Larisa Dolina, Valeriya, Leonid Agutin and the group Lubeh. People in talk-show studios discussed the disaster in the Far East, and a newsroom was set up, from which there was live coverage and news with direct link-ups to flooded areas every two hours. Well-known artists and public figures also came to the newsroom to talk on the phone with people affected by the flooding. In addition, they made phone calls to thank those who had texted a short number to donate money for people living in areas of the Russian Far East. Behind the scenes at Channel One, people said they had found out about the special broadcast two weeks ago. It was decided to devote the whole day to the marathon (from 8 a.m. to 6 p.m. Moscow time), “so that we could have live coverage in all the time zones,” said Ernst. Sergei Yursky, Yuri Solomin, Dmitry Dyuzhev, Lev Leshchenko, Filipp Kirkorov, Kseniya Alferova, Yegor Beroyev and Iosif Kobzon took turns manning the phones during the day. Ernst says that the organizers of the marathon did not want the broadcast to have a tragic feel. Now, according to the general director of Channel One, all the money donated will be put into one bank account and will be used for building prefabricated housing areas. In the next few days, a company will be founded to manage the whole process — drawing up contracts, transport and on-the-spot assembly. Ernst has already had talks with Yuri Trutnev, the presidential plenipotentiary envoy in the Far Eastern Federal District, and space will be allocated for construction on Oct. 1, at a conference with Far Eastern District governors.